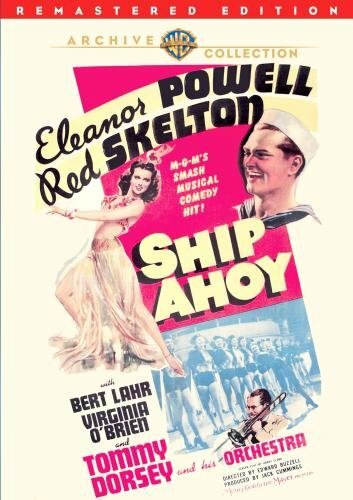 Ship Ahoy is a very funny musical-comedy-romance from MGM that begins with Bert Lahr (the Cowardly Lion from The Wizard of Oz) in one of his rare film appearances playing Skip Owens. Skip has fallen hopelessly in love with stage dancer Fran Evans (Virginia O’Brien), who is about to leave for Manila along with the Tommy Dorsey band and the rest of her troupe, headlined by Tallulah Winters (Eleanor Powell). Tallulah is a talented dancer who is taken to see a government agent, who wants her to smuggle a magnetic mine to their people in Manila. Which allows Skip Owens/Bert Lahr to follow the dancer he’s in love with on their voyage to Manila. Once on board the ship, Merton and Tallulah fall in love, leading to an excellent musical number I’ll Take Tallulah. It also allows her to demonstrate her ability to tap dance Morse code — which becomes crucial later on. The I’ll Take Tallulah dance routine. Red Skelton trying to move a suitcase containing the magnetic mine along the deck of the ship. A funny drunk scene where Red Skelton and Bert Lahr are trying to escape from the spies. The comedy/romance between the two couples. Virginia O’Brien shines in her interactions with Bert Lahr. It’s one of my favorite Red Skelton films, and I hope it becomes one of yours as well. I rate it 4 clowns out of 5. The title was changed from I ll Take Manila to Ship Ahoy because the Philippines had already fallen. The ship destination was changed from Manila to Puerto Rico. The song I’ll Take Manila was changed to I’ll Take Tallulah. One song I Fell In Love (With the Leader of the Band), by Jule Styne and Herb Magidson, was filmed but not used. The footage was used in The Great Morgan (1946). Frank Sinatra makes his film debut as a singer with the Tommy Dorsey Orchestra. Also look quickly for Broadway star John Raitt as a young sailor. Ship Ahoy, a patriotic musical comedy of the WWII era, swings to the tempo of its big-band times. Eleanor Powell plays a leggy lead dancer on a cruise ship who is asked to transport a mine to Puerto Rico. Neither she nor her pulp-fiction-author beau (Red Skelton) knows she’s actually working for spies who got the idea from one of his potboiler novels! The supporting cast includes Bert Lahr (the Cowardly Lion in The Wizard of Oz) and Virginia O’Brien (Till the Clouds Roll By). All of the festivities are set to the swing of Tommy Dorsey and his Orchestra featuring a very young Frank Sinatra as vocalist.